Neil Jordan’s Michael Collins is a UK/US/Ireland co-production. International productions guarantee an international cast which can be nice but in this case, I would say, it did prevent the movie from being great. There is no drama teacher in the world who will achieve to make Julia Roberts or Aidan Quinn sound Irish. Liam Neeson as Michael Collins, Alan Rickman as De Valera and a very young Johnathan Rhys Meyers, striking the fatal blow, are well-chosen. Michael Collins was probably one of the most controversial and tragic figures of Irish history. A charismatic man who knew how to convince those who followed him. A man who wouldn’t shy away from killing yet didn’t take it lightly. 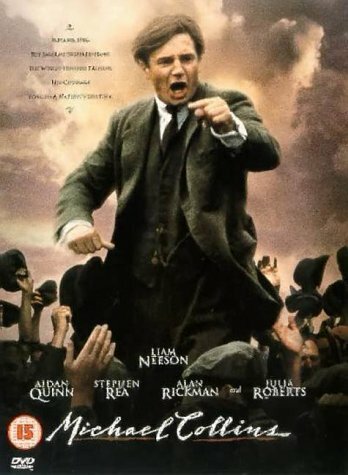 The movie starts with the Easter Rising in 1916 with Michael Collins rallying the masses against the British occupation. It would take another three years until this initial movement lead to the Irish war of Independence. It is a fierce and bloody war. A the end of the war stands the treaty, something that was unthinkable for 700 years. The British government allowed the Irish Free State but kept the Northern Provinces and wanted the Free State to swear allegiance to the king. Michael Collins considered this to be the best he could achieve and wanted to sign the treaty but the men around the future president de Valera wanted a completely free Ireland and this is where the movement for Independence split into two sections who would fight each other fiercly. The movie shows us a Michael Collins who is tired of fighting and bloodshed and longs for peace. He is sure, if the treaty isn’t signed the bloodshed will be endless. An important part of the movie is dedicated to the friendship between Michael Collins and his best friend Harry Boland (Aidan Quinn). For four years they are also caught up in some sort of love triangle as both men love Kitty (Julia Roberts). It takes a while until she confesses that she loves Collins. Her confession is not the only thing that drives the men apart. Politically they are not on the same page anymore. Best friends become enemies. Michael Collins is shot in 1922 by one of de Valera’s men. This is the beginning of the Irish Civil War. I liked the movie despite its flaws, one being, as already stated, the choice of American actors, the other being quite a few historical inaccuracies. Apparently Neil Jordan had good reasons for altering the facts. I am not sufficiently familiar with the details to point out what is correct or not. There is one particularly awful scene in which a British tank opens fire on a the players in a sports game. In reality this was much more horrible. Michael Collins is a fascinating character and I could very well see myself read a biography in the future. He was a leader and an adept fighter. His fighting tactics seem to have inspired quite a few future struggles. The group around him was constantly hunted by British secret agents and policemen. Michael Collins’ tactic was to know more about the agents than they knew about them and then to hunt them down. There are a lot of executions to be seen as they operated according to the dictum “who is not with me is against me”. At times the movie reminded me of movies about the resistance. Torture, execution, changing of sleeping quarters etc. A while back I reviewed another movie on the Irish War of Independence and the subsequent Civil War, The Wind that Shakes the Barely. Michael Collins is never seen but constantly spoken of in the movie so I was really curious to see this. Comparing the two movies I’m afraid I must say, The Wind that Shakes the Barley feels more authentic, it is a truly outstanding movie. Despite its flaws Michael Collins being a Neil Jordan film offers a lot and is beautifully filmed. It is as much a character portrait, as the story of a friendship and a romance. I enjoyed it and would recommend it. This entry was posted in Actors, Civil War, Film directors, History, Irish Civil War, Irish War of Independence, Movie, Reviews, Trailer, True Story, War Movie and tagged Aidan Quinn, Alan Rickman, History, Irish Civil War, Irish War of Independence, Johnathan Rhys Meyers, Julia Roberts, Liam Neeson, Michael Collins, Movie Trailer, Movies, Neil Jordan, Reviews, True Story, War Movie. Good review. It’s been a long time since I saw it and this makes me want to revisit it. I understand your complaint about Roberts, but Quinn was born of Irish parents and lived in Ireland part of his childhood. Why wouldn’t he have a competent accent? That’s pretty embarrassing. The casting of Roberts was obviously done for reasons other than authenticity. I thought he had Irish roots but it didn’t sound as if. When you hear Johnathan Rhys Meyers or Leam Neeson that sounds very different. Maybe another county? It is strange knowing that a movie about Irish war is using American actors…they have plenty great actors there. It is so different to The Wind That Shakes The Barley, as the director refused to use famous and non Irish actor. He even refused Cillian because he was already famous in Hollywood…but he accept him after the audition and thee fact that he is from Cork. Reading this post reminds me of Jordan’s reluctance to make Breakfast on Pluto. Is this movie critically bad? Thanks, Novroz. No it isn’t bad at all, I just thought it pointless to use American actors but that had obviously something to do with money. They certainly got more funding like this. Ken Loach is moch more of an idealist. Fortunately Jordan didn’t use any american in Breakfast on Pluto. I think you can also consider BoP as a war movie, although I didn’t mentione it in my review http://t.co/jguD9kd but the setting was during IRA movement. His friend is killed because of it. And he/she always say ‘Serious serious serious’ when concerning the movement. Neil was a bit reluctant to do the movie due to the IRA movement, but Cillian convinced him to do it. I still haven’t watched it, thanks for reminding me, I really want to. Julia Roberts is trying really hard but it is only trying. She doesn’t manage the accent for very long.